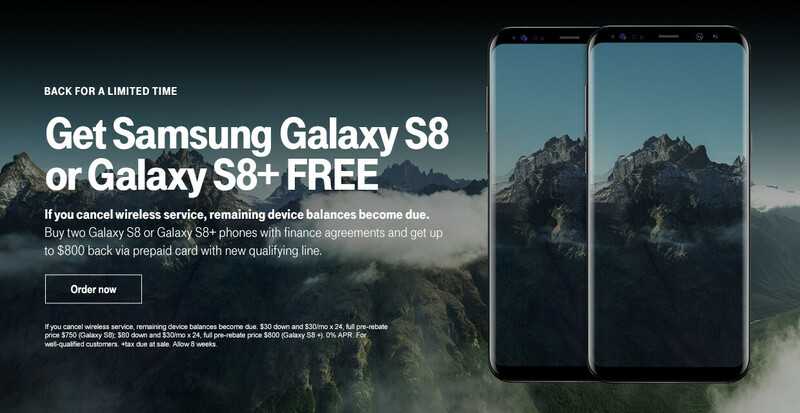 Back in May, shortly after it started selling the Galaxy S8 and S8+, T-Mobile ran a BOGO promotion allowing customers to buy 2 new Galaxy handsets for the price of 1. While that didn't last long, T-Mobile is now back with a similar deal. Starting today, July 28, you can purchase two Samsung Galaxy S8 or Galaxy S8+ smartphones from T-Mobile and receive up to $800 back. The deal is available to both existing customers (who must add an additional line of service), and new customers (who must add a new line). You'll have to get both devices on T-Mobile's 24-month Equipment Installment Plan, and keep all lines active. After you buy your two Galaxy S8 or S8+ units, you'll have to visit https://promotions.t-mobile.com and enter the promo code 17GS8SAMBOGO (plus some extra required details) within 30 days of activation. In 6 to 8 weeks, T-Mobile will send you a Prepaid MasterCard Card with $750 (for the S8) or $800 (for the S8+). Nice, huh? You can find all the official details about this offer at the second source link below. We already know it isn't lol However, buying a Note 8 no matter what. I like what I see from it. No phone is lag-free in literal sense. I wish Samsung would release official sales numbers. Doesn't seem like it's selling too well. They are also doing it with iPhone 7, buy one get a free iPhone 7 as well. Is Apple doing that or carriers in order to sell another contract? Just like this deal for Samsung. They are so annoying with this additional line thing. Sounds like you are experienced with this. My issue is that because of the additional line, you can't upgrade two lines at once, and I don't like that. If Josie wants the s8 and is on a plan with John, who also likes it, why should Josie have to get another line when John would like to upgrade too? Again... $40 plus taxes for a flagship... if josie and john cant swing that, then josie and john dont need a new cell phone. They ended the promo a few weeks back. So they must have reactivated it. TMo users, get in on this. The S8 Plus is the best phone I've used, bar none. Take advantage of a deal that great, for a phone this great. T-Mobile is taking BOGO deals by storm!